RAVENOL 6HP ATF Fluid is an advanced automatic transmission oil manufactured in Germany using highest quality base oils and produced on the basis of hydrocrack oils and PAO. It also includes unique additives and inhibitors which guarantee the perfect function of 6HP automatic transmissions. RAVENOL 6HP automatic transmission fluid was not engineered as a generic transmission fluid intended to cover broad base of applications like other brands of ATF's on the market. Due to its high quality PAO base oils and unique additive package, 6HP transmissions are guaranteed maximum wear protection in every operating condition. RAVENOL ATF 6 HP Fluid has a tan brown like color just like the O.E. factory fill. RAVENOL 6 HP ATF Fluid was developed for use in the newly developed 6HP-series transmission of ZF 6HP19, 6HP21, 6HP26, 6HP28, 6HP32, 6HP34. 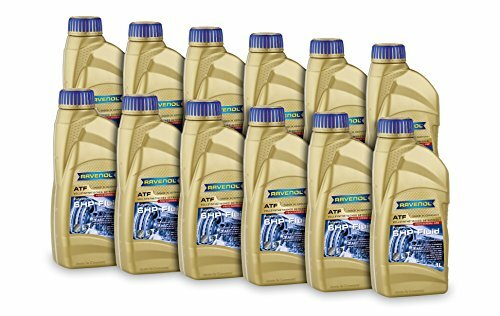 Note: RAVENOL ATF 6 HP transmission fluid is NOT to be used in the 6 HP26A61 which was fitted in VW/Audi models equipped with W12 engines (on these vehicles use only original VW G055 162 A2 blue colored transmission Fluid, ATF) and also 6HP19X transmissions for Audi Q7 models, 6HP19A, 6HP28AF (on these vehicles use only original VW G060 162 A2 green colored transmission Fluid, ATF).